Lately I’ve been drawing inspiration from simple & classic looks like this one…especially as the weather warms up & layers have become a thing of the past. 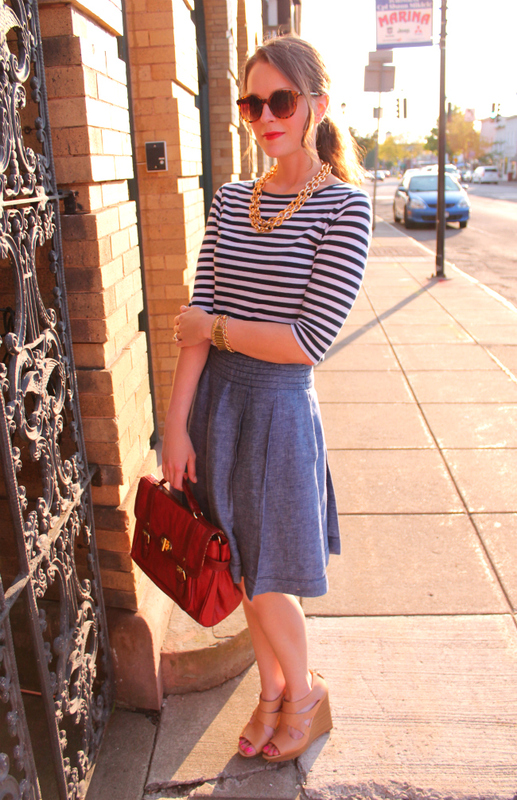 A breton striped top + chambray skirt is a no-fail combination that’s equal parts easy, comfortable & chic. My fav is the link necklace. love the new streamlined blog! and your awesome striped shirt! Hey there loving the new logo! I really love stripes and this stripe on stripe look is great. Love the red bag for a pop of color. I love the nautical look 🙂 Cute outfit! such a cute outfit! love the necklace! The perfect summer outfit! I love the new simple layout! Love this look! I have a thing for stripes. Stripes will never go out of style for me…..you look FAB! Oh, I love this outfit so much! It's perfect for the warm weather we're finally getting! Also, the site looks great! Absolutely gorgeous outfit, that striped top is so chic! that skirt is so simple but so beautiful! I also love your necklace 🙂 great look! Love the necklace! What a great blog idea, I'm your newest follower! I just found your blog and LOVE it! 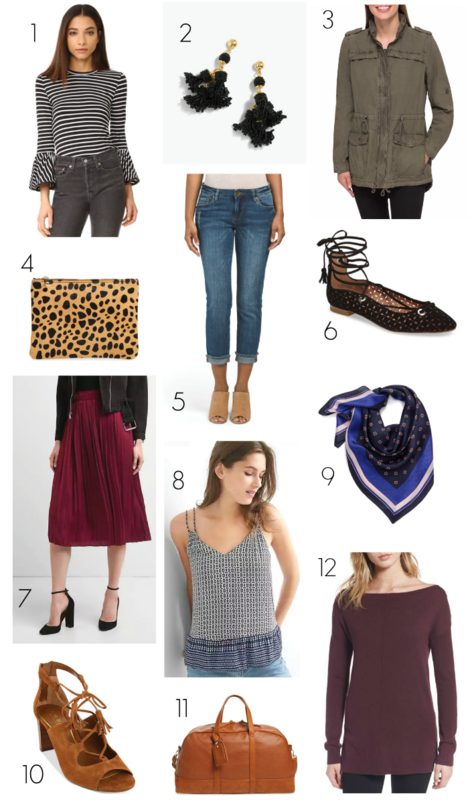 Your style budget is EXACTLY what I'm looking for. Thank you so much! 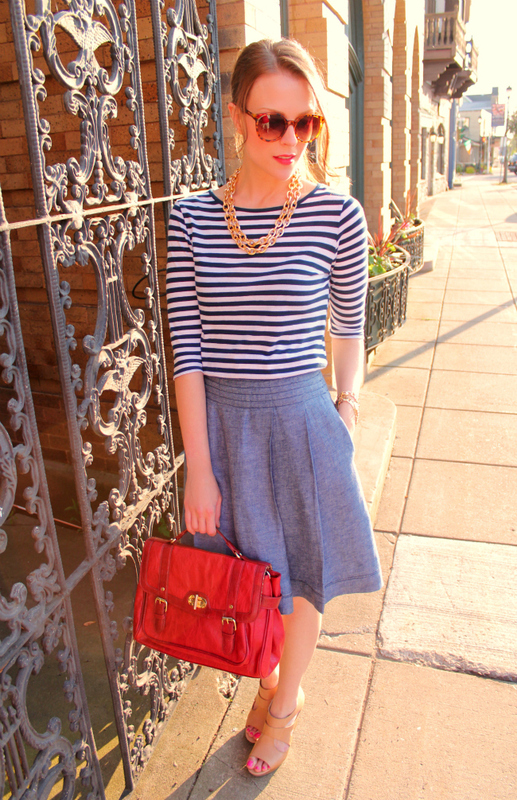 LOVE the chambray skirt! Great look, Kimberly! In love with that skirt! The simplicity of the chambray but with the intricate detail of the darts- absolutely love it! Also, loving the new layout! It look fantastic! Love the new blog design and this look! Love the look and new design! That's so funny, I'm in the middle of having mine done too! Great new blog layout, looks great! And as always, your style is gorgeous! LOVE this look! I am all about chambray too. So pretty!! I love your chain necklace! This is adorable! The accessories that you added are perfection! You remind me a little of Taylor Swift – very pretty! This look really is so classic and you look lovely! Your shoes are wonderful, too!!! Absolutely adore this classic look AND totally digging the new site. Awesome! the light in these photos is just gorgeous, and i adore the chain necklace. i don't know what the heck happened to my comment earlier! i was saying that i think you NAILED this look …better than the pinterest inspiration! such a cute skirt! love your style dear! I follow you by now! I'm waiting you on my blog and if you want we can follow each other! I love this outfit! So simple and chic- especially with the red lipstick! I wish it was warm enough here to not have layers- hopefully soon! I prefer your look – you look so good! You cannot go wrong with an outfit such as this, it's a perfectly classic look and all wardrobes should have some Breton stripes I agree! You looked like you just stepped off a yacht – beautiful. Nautical chic at its best! That's a refreshing chic look!